Lee Mullican (1919–98) was best known for his inimitable West Coast–inspired explorations in abstraction, infused with mysticism and the transcendent. First exhibited as part of the pivotal exhibition of the Dynaton Group, which Mullican cofounded with fellow artists Gordon Onslow Ford and Wolfgang Paalen, his works are today widely collected and held in the permanent collections of the San Francisco Museum of Modern Art, Whitney Museum of American Art, Los Angeles County Museum of Art, and Metropolitan Museum of Art, among many others. 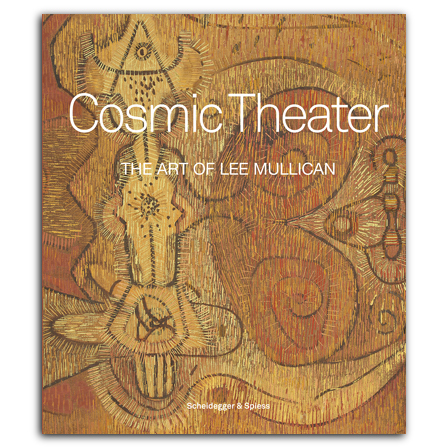 The first book in more than a decade to focus on this important figure in twentieth-century American art, Cosmic Theatre: The Art of Lee Mullican surveys a key theme running through the artist’s career, framing his unusual hybridization of symbolic figuration, abstracted landscapes, and abstract space with his long-time fascination with the sky and the galaxy beyond. The book explores the development of the Mullican’s work in the context of his time and his biography, looking also at the implications of Jungian philosophy in relation to his admiration of pre-Columbian and Native American cultures. Michael Auping’s essay is complemented by fifty full-color illustrations, featuring major rare paintings and drawings by Mullican from the 1940s to the 1970s. is a curator and scholar of abstract expressionism, specializing in international developments in postwar art. From 1993 to 2017, he was chief curator at the Modern Art Museum of Fort Worth. is a director with James Cohan Gallery in New York, where she also oversees Lee Mullican's estate.